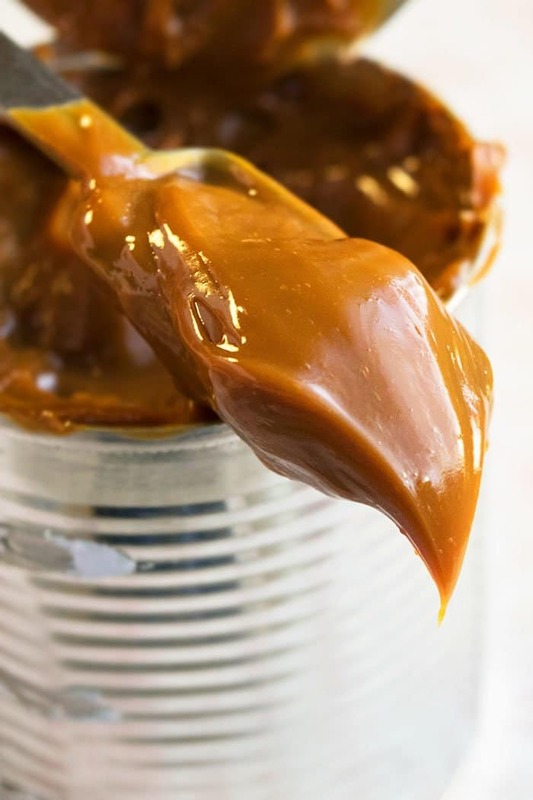 Quick and easy Dulce De Leche recipe, homemade with 1 simple ingredient. Smooth, rich, thick, creamy, caramel flavor, made from sweetened condensed milk. Can be made on stovetop, slow cooker or oven. 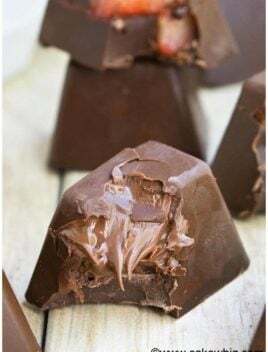 This sweetened condensed milk caramel is so much easier than making it from scratch, which can easily burn and requires a close eye. How to make homemade dulce de leche (recipe)? There are a few different methods and they all work well. I prefer the stovetop method but a few of my friends love the crockpot method. Stovetop Method– Add cans of condensed milk (14 oz each) in a large pot. Cover cans with water until they are fully submerged. Bring to a boil. The, reduce the heat to Low and cook for 3 hours. Remove cans from water and let them cool down completely and then, enjoy! Oven Method- Heat oven to 425 degrees F. Pour 1 can of condensed milk (14 oz can) in a 9 inch oven-safe deep dish and cover it with aluminum foil paper. Set this dish in a roasting pan and add enough hot water in the pan to reach halfway up the dish. Bake for 45 minutes. At this point, check water level and add additional water, if necessary. Then continue baking for another 45 minutes- 1 hour until condensed milk becomes thick and brown. Remove dish from the oven and let it cool down completely and then, enjoy. Crockpot/ Slow Cooker Method– Place cans of condensed milk (14 oz each) in slow cooker. Cover cans with hot water until they are fully submerged. Cover and cook on Low for 8 hours. If you want it to be dark in color are more thicker, cook for an additional 2 hours. Remove cans from crockpot and let them cool down completely and then, enjoy! 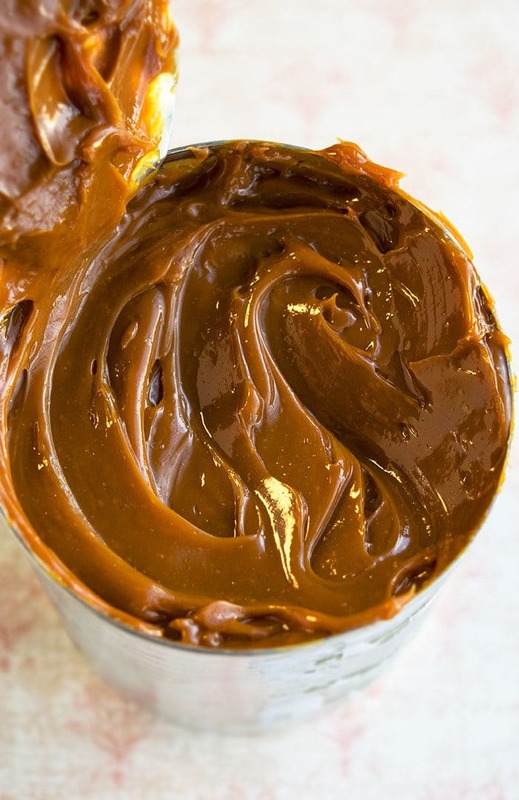 What is dulce de leche? What does dulce de leche mean? When it’s translated, it’ supposed to mean “candy of milk” or “candy made of milk” or “milk candy.” It’s a traditional Argentinian dessert made by caramelizing sugar in milk. It’s pretty much slow cooked condensed milk (or milk and sugar). 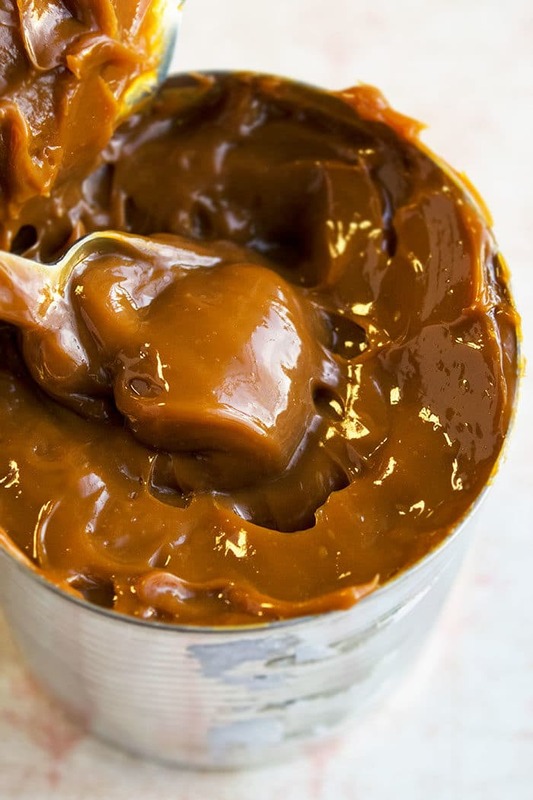 What is the difference between caramel and dulce de leche? Caramel is a reduced mixture of water, sugar, heavy cream and butter. However, the latter is typically made with condensed milk and simmered for hours and only composed of sugar and milk. However, both have a rich, creamy, sticky consistency and are brown in color. 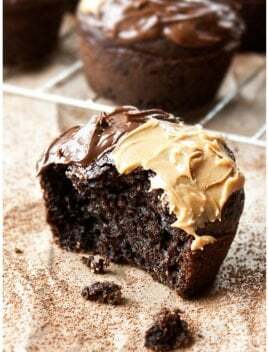 Filling– In cakes and cupcakes. 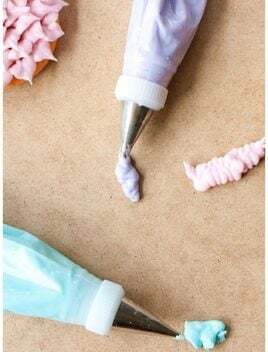 Drizzle– Over cakes, cupcakes, cheesecakes, ice cream. Sweetener– Add it in coffee, milk, tea or even milkshakes. Spread– Over toasts, bagels, muffins, biscuits instead of jam. 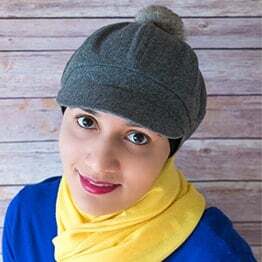 Topping– Over pancakes, waffles, crepes instead of maple syrup. 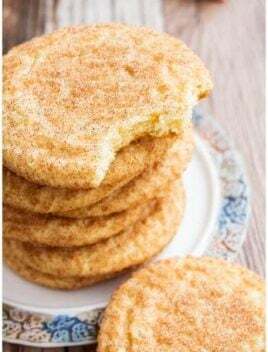 Dip– Serve it at parties with biscuits, graham crackers and even these Churro Cookies. Homemade gift– For family and friends during Christmas holidays. Dulce de leche cake– Make my family’s Best Vanilla Cake or this Chocolate Cake and drizzle this, prior to serving. Dulce de leche cheesecake– Make a New York Cheesecake and drizzle this, prior to serving. Dulce de leche ice cream- Make your favorite homemade vanilla ice cream and stir this in but don’t mix it fully so that you end up with caramel swirls. Keep a close eye on the amount of water-The cans need to be submerged in water. If the water evaporates during boiling, they can burst open and make a sticky mess. Use tongs– The cans are hot. Remove them with tongs and don’t burn yourself. Don’t open hot cans– They must fully cool down before you open them or they can burst because of the pressure that’s built up in there. Remove labels from cans- This is not required but I like to do it because it tends to fall off during boiling and then, floats around. I find that very annoying…lol. Consistency- It thickens, as it cools. If it becomes too thick after cooling, heat it in the microwave for 20-30 seconds to make it a pourable consistency. You can also add a splash of heavy cream, if you like. If it’s too thin, chill in the fridge for a few hours, which will thicken it up. 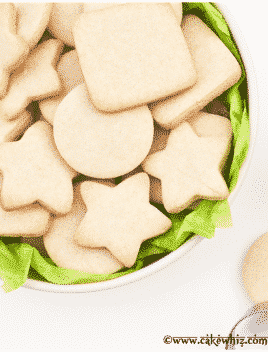 Don’t use evaporated milk– Because that’s entirely different and doesn’t work in this recipe. How long to cook? That’s a personal preference. I like mine thick and tan/brown color, just like caramel and cook for 3 hours. Some people prefer it lighter in color and golden brown and cook for 2 hours and 15 minutes. Don’t over-crowd the pot with cans– Because over-crowding prevents even cooking. Can you freeze it? Yes, once it cools down completely, freeze it in an air-tight, sealed container for up to 1 month. 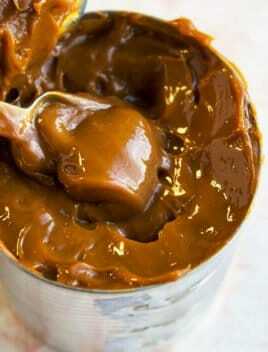 Quick and easy Dulce De Leche recipe, homemade with 1 simple ingredient. Smooth, rich, thick, creamy, caramel flavor, made from sweetened condensed milk. Place them in a big pot right-side up or on or their sides. Cover cans with water so they are completely submerged. 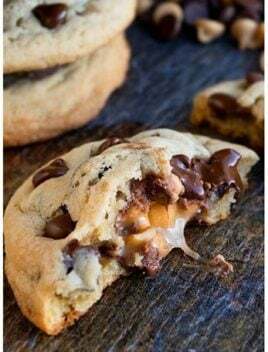 Reduce the heat to Low and cook for 3 hours (if you want it to be thick and a dark caramel color) or cook for 2 hours and 15 minutes (if you want a lighter color). Note: Keep a close eye on the amount of water. The cans need to be completely submerged. Add more water, as it evaporates during cooking. Then, carefully remove cans from water, using a pair of tongs and allow them to cool down completely.